The UNLV Rebels football program is a college football team that represents the University of Nevada, Las Vegas (UNLV). The team is currently a member of the Mountain West Conference, which is a Division I Bowl Subdivision (formerly Division I-A) conference of the National Collegiate Athletics Association (NCAA). The program which began on September 14, 1968, is coached by former Bishop Gorman High School head coach, Tony Sanchez. The team's home games are played at Sam Boyd Stadium in Whitney, Nevada. On March 12, 1985, UNLV forfeited all of their wins for the 1983 and 1984 seasons by the order of the National Collegiate Athletic Association (NCAA) due to multiple NCAA violations on ineligible players. In 1967, Nevada Southern University announced that they would field a collegiate football program beginning on September 14, 1968 and announced that the team would be a Division II Independent and that Bill Ireland would be the program's first head coach. The Rebels played their first game of their inaugural season against the St. Mary's Gaels at Cashman Field in Las Vegas. The Rebels won the game, defeating the Gaels 27–20 in front of 8,000 fans. The Rebels remained undefeated until the last game of the season, losing to Cal Lutheran Kingsmen, 13–17, as the Rebels finished their inaugural campaign 8–1. The following year, the Rebels played their first game against in-state rival Nevada, losing to the Wolf Pack 28–30. UNLV gained revenge, defeating Nevada the following year, 42–30, in the first year that the Fremont Cannon was awarded. On September 25, 1971, the Rebels played their first game against a Division I school, when they played Utah State of the Pacific Coast Athletic Association (PCAA), ultimately losing 7–27. On October 23, 1971, the Rebels opened their new home, Las Vegas Stadium, against Weber State, losing 17–30. At the end of the 1972 season with a disappointing 1–10 record, Ireland announced he was stepping down, leaving the Rebels with a 26–23–1 record. Ireland was replaced by Ron Meyer before the start of the 1973 season and Meyer led the Rebels back to powerhouse status with an 8–3 record, including their first victory over a major college opponent, thrashing Marshall 31–9. The Rebels continued their strong campaign, breaking the national Division II top-10 and announcing their first All-American, running back Mike Thomas, who ran for the Division II national rushing title with 1,741 and setting nine school records in the process. The Rebels' success continued in 1974 with the only undefeated season in school history, finishing 11–0 and ranking second in the national Division II polls, the highest any Rebels football team has ever placed. The Rebels embarked on their first post-season journey in a national quarterfinal against Alcorn State, defeating the Braves 35–22 in Las Vegas. The Rebels memorable season ended in the national semifinals in the Grantland Rice Bowl, losing to Delaware 11–49. Meyer left the program in 1976 to take the head coaching position at collegiate powerhouse, Southern Methodist University. Former Boise State coach Tony Knap took over the Rebels in 1976, after Ron Meyer's departure. Knap was able to continue the Rebels prior success under Meyer, with a 9–3 record, a ranking of 7th in the nation and a berth in the Division II playoffs, ultimately losing to Akron 6–27 in the national quarterfinals. After ten years as a Division II independent, the program made the jump to the Division I level in 1978, independent of any conference affiliation. On September 9, the Rebels played their first game as a Division I school, losing to Washington State 7–34. The Rebels defeated their first major college opponent away from Las Vegas, with a 33–6 victory over Colorado State in Fort Collins. At the end of the season, the Rebels made a trip to Yokohama, Japan to compete against college football powerhouse Brigham Young, losing 28–24. Even with the hard end to the season, the Rebels still produced a memorable year, going 7–4 in their first campaign at the Division I level. The 1981 season proved to be the last in Knap's tenure at UNLV, as he retired from coaching after a year of accomplishments, including the Rebels' first appearance in the ABC's Regional Game of the Week (a 21–45 loss at Wyoming), a 45–41 upset of 8th-ranked BYU in Provo, Utah and securing the programs 100th win (27–20 at UTEP) in El Paso, Texas. The 1982 season was a big year in UNLV football history as the program hired its fourth head coach, Harvey Hyde and the Rebels became affiliated with a college athletic conference when they joined the Pacific Coast Athletic Association (PCAA). The Rebels first PCAA game was a 27–29 loss to Pacific on October 2. It took the entire season before the Rebels won their first conference game, a 42–23 victory against Cal State Fullerton on November 27. The Rebels won their first conference championship in 1984 as the Randall Cunningham led Rebels finished 11–2, including the program's first trip to a bowl game, a 30–13 victory over Toledo in the California Bowl in Fresno, California. Hyde stepped down after the 1985 season and a 5–5–1 record and the NCAA discovery that several players on the 1984 Rebels were ineligible. The Rebels were forced to forfeit their entire 1984 season, including the California Bowl. Wayne Nunnely became the program's fifth head coach on September 20, 1986 and he coached the Rebels to a 17–7 victory over Wisconsin in front of the first sellout crowd in Silver Bowl Stadium history, a then record 32,207 fans. One of Nunnely's key players was Elbert "Ickey" Woods, the first Rebel and PCAA running back to win the national Division I rushing title, as he rushed for 1,658 yards and was drafted by the Cincinnati Bengals in the 1988 NFL Draft. 1994 was another memorable season for the Rebels, as wide receiver Randy Gatewood set two single-game receiving records in a 38–48 loss to Idaho on September 17. The Rebels then stunned the heavily favored Nevada, 32–27 to win a share of the Big West Conference championship, the program's second title (but the first one they were allowed to keep). The Rebels then defeated Central Michigan 52–24 in the Las Vegas Bowl on their home field. In 1996, the Rebels along with San Jose State left the Big West Conference and became a member of the heavily expanded Western Athletic Conference. The league announced that it would hold a championship game for the top team in each of the two divisions at the end of each season and that the game would be held at Sam Boyd Stadium in Las Vegas. The Rebels lost their first WAC game, 65–17 to Air Force on September 7. The Rebels finally won their first WAC game in a 44–42 shootout against San Diego State on November 16, in a game in which freshman quarterback John Denton set a NCAA freshman record for passing yards with 503. Although the Rebels finished 1–11, Denton still set ten NCAA freshman records. On October 17, 1998, UNLV played their first overtime game, losing to San Diego State 17–20. In 1999, the Rebels finished with the program's first winless season, but had their first consensus First Team All-American in punter Joe Kristosik, who averaged a nationally-best 46.2 yard per punt average. In 1999, the Rebels made headlines, first by leaving the WAC with seven other schools to form the Mountain West Conference, but also by announcing that the program had hired legendary collegiate and professional coach John Robinson as their eighth head coach. The school would repeat its conference hardships in the Mountain West as they lost their conference opener on September 25, 14–52 to Utah. The Rebels won their first Mountain West game on October 9, 35–32 against Wyoming. Although 1999 was a rough year, a UNLV win in week two featured one of the most improbable endings in college football history. The Rebels trailed on the road against Baylor 24–21 with ten seconds left. Baylor had the ball at the UNLV five yard line and UNLV was out of time outs. A kneel down would have given Baylor the victory, but Baylor chose to run the ball, fumbled and UNLV's Kevin Thomas recovered and returned it 99 yards for a touchdown and a 27–24 Rebel win. 2000 seemed to be the year in which Rebels football would finally turn around, as the Rebels made numerous gains to become a competitor for the Mountain West crown. The Rebels started by upsetting previously undefeated Air Force 34–13 on September 30 in the first time that ABC came to Las Vegas for the Rebels football game. The Rebels then ended a five-game skid to rival Nevada, defeating the Wolf Pack 34–13 in front of the largest crowd to see a game in the Battle for Nevada. The season went down to the wire as the Rebels had to pull out a 34–32 victory on the road against Hawaii to clinch their third berth in a bowl game. The Rebels were chosen as the Mountain West representative for the Las Vegas Bowl on December 20. The Rebels would continue their undefeated streak in bowl games as they defeated Arkansas 31–14 in front of a Las Vegas Bowl record 29,113 fans. They finished the season 8–5. Before the start of the 2001 season, the Rebels garnered national accolades as the team was ranked #25 in Sports Illustrated's preseason Top 25 and #24 in Football Digest's rankings. Quarterback Jason Thomas was named a candidate for the Heisman Trophy, ranking as high as #7. Although the Rebels seemed good on paper, the team did not gel and ended the season a disappointing 4–7. On October 5, 2002, the Rebels defeated rival Nevada 21–17 for Robinson's 200th career coaching victory. Robinson retired after the 2004 season, having led the Rebels to a bowl game and five consecutive victories over rival Nevada. On December 6, 2004, the Rebels hired Utah assistant coach Mike Sanford as their ninth head football coach. In his first three years at the helm of the Rebels football program, Sanford failed to win more than two games and had back to back 2–10 seasons, finishing last in the Mountain West all three years. Sanford failed to beat Nevada all five years he coached at UNLV. Sanford has sent former Rebels Eric Wright and Beau Bell to the NFL draft. The Rebels finished the 2008 season with a 5–7 record after starting the season 3–1. This was the best win-loss record UNLV had since going 6–6 in 2003. It also marked the first time UNLV did not finish last in their division since 2004. Their 23–20 victory over #15 Arizona State was the first time the Rebels had beaten a ranked opponent since 2003. The 2009 season was a disappointment and it led to Sanford's dismissal as coach. UNLV was picked to finish fifth in the conference, but the team began to fall apart after a surprising loss at Wyoming. That was followed by losses at Nevada, against Brigham Young and Utah, and at Texas Christian and the Air Force Academy — games in which UNLV was outscored 243–81. They rebounded toward the end of the season and finished 5–7. After the Air Force loss on November 14, the school announced Sanford's last game as coach would be the season finale against San Diego State. Former Montana head coach Bobby Hauck was named the program's next head coach on December 21, 2009. Former TCU, Alabama and Texas A&M head coach Dennis Franchione was also interviewed for the position. Before the 2014 Reno game, Bobby Hauck announced that he would be stepping down following the conclusion of the 2014 season. On December 10, 2014, the school announced that Tony Sanchez of Bishop Gorman High School would succeed Hauck as head coach of UNLV. Sanchez announced his completed staff at UNLV on December 22, 2014, which would feature staff members from Nebraska, Colorado, Oregon State, USC, Houston, Georgia State and Bishop Gorman. In 2016, a new domed stadium was proposed and approved for Las Vegas that will be the home to the Las Vegas Raiders of the National Football League (NFL) after the team relocates to Las Vegas from Oakland and the Rebels replacing Sam Boyd Stadium. The stadium is expected to be completed in 2020. On September 2, 2017, the UNLV Rebels lost to the Howard University Bison 40–43 in Sam Boyd Stadium. Howard, a MEAC FCS opponent, was coached by Mike London, and led at quarterback by freshman Caylin Newton, younger brother of NFL star Cam Newton. As of September 2017, due to high off-shore point spread numbers, Howard's victory against UNLV is the biggest point spread upset in college football history. UNLV has one conference championship. They had won a share of the Pacific Coast Athletic Association (now known as the Big West Conference) championship in 1984, but they forfeited all the wins from that season due to violations. UNLV has played in four bowl games. † UNLV forfeited the original 30–13 win due to multiple NCAA violations on ineligible players UNLV also played in the 1974 Grantland Rice Bowl, at the time a national semifinal for Division II, losing to Delaware. Nevada leads the series 27–17 as of the conclusion of the 2018 season. Glenn Carano – Retired Quarterback, back up to Roger Staubach, father of Gina Carano. Hunkie Cooper – Retired Wide receiver/Defensive Back, an Arena Football League Hall of Famer. ^ McCurdie, Jim (March 13, 1985). "UNLV Punished for Using Ineligible Football Players". Los Angeles Times. Retrieved November 26, 2017. ^ "UNLV Names John Robinson Head Coach". UNLV Rebels. December 3, 1998. Retrieved July 13, 2008. ^ "Rebels Accept Bid To Las Vegas Bowl". UNLV Rebels. December 4, 2000. Retrieved July 13, 2008. 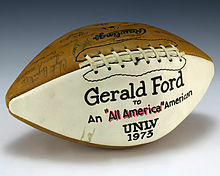 ^ "Las Vegas Bowl IX". UNLV Rebels. December 22, 2000. Retrieved July 13, 2008. ^ "Sanford Takes Over At UNLV". UNLV Rebels. December 6, 2004. Retrieved July 13, 2008. ^ Greene, Ryan (December 21, 2009). "Hauck, Franchione set to interview for UNLV football coaching post". Las Vegas Sun. Retrieved December 21, 2009. ^ "Sanchez Announces Coaching Staff". UNLV Rebels. December 22, 2014. Retrieved December 22, 2014. ^ Anderson, Mark (October 14, 2016). "UNLV coach Tony Sanchez elated about what new stadium could mean to his program". Las Vegas Review-Journal. Retrieved October 20, 2016. ^ "Howard just beat UNLV in the biggest spread upset in CFB history". ^ "Howard's win over UNLV is biggest upset vs. spread in college football history". ^ a b "2007 UNLV Rebels Football Media Guide - Record Book" (PDF). UNLV Rebels. Retrieved July 13, 2008. ^ ""UNLV Athletics to Retire Jerseys of Gondrezick, Theus" at UNLV website". UNLV Rebels. Retrieved April 12, 2013. ^ "UNLVREBELS.COM - University of Nevada Las Vegas Official Athletic Site". www.unlvrebels.com. ^ "UNLV Rebels Football Schedules and Future Schedules". fbschedules.com. Retrieved February 10, 2018. Wikimedia Commons has media related to UNLV Rebels football.